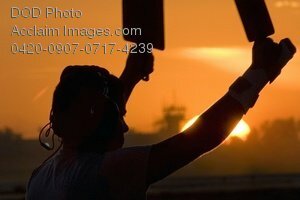 Description: Free, public domain image: U.S. Airman Using Marshalling Paddles to Direct a C-130 Hercules Aircraft on to a Taxiway. U.S. Airman 1st Class Chadley Williams, 777th Expeditionary Airlift Squadron (EAS), uses marshaling paddles to direct a C-130 Hercules aircraft onto a taxiway at Joint Base Balad, Iraq, Dec. 6, 2008. The C-130 is deployed to 777th EAS from Wyoming Air National Guard's 153rd Airlift Wing. (U.S. Air Force photo by Tech. Sgt. Erik Gudmundson.